After spending close to a decade examining the structure of nanowires made of pure silver, scientists at the U.S. Department of Energy's (DOE) Argonne National Laboratory have discovered a set of unusual behaviors in nanocrystals with a strained, five-fold symmetry formed by "twinning" in the crystal structure. The twinned crystals' unusual pentagonal symmetry and complicated structures distinguish them from the cubic crystalline lattices typical of many silver nanoparticles. The "twinned" structures occur when adjacent domains within the nanoparticle arrange themselves by sharing the same planes, said Argonne nanoscientist Yugang Sun. Since the five-fold twinned structures do not perfectly fill the volume that the atoms would normally occupy in silver, there is a lot of strain in the atomic structure or lattice. 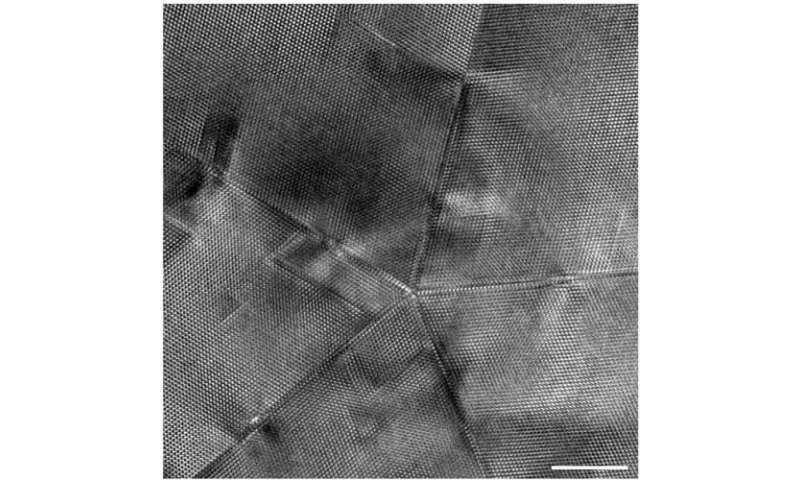 Typically, nanoparticles made from precious metals have formed highly symmetric lattices in a configuration called "face-centered cubic"; but the strains in five-fold twinned nanowires distort the lattices into a body-centered tetragonal symmetry. The difference between the atom arrangements in nanoparticles could determine both the strength of the material as well as its efficiency as a catalyst, Sun said. "This is a fundamental study that looks in depth into the nature of metals at the most basic level," he said. "However, it's essential that scientists understand such properties in order to exploit any advantages that these very small structures might provide us down the road." Sun and his colleagues also discovered that the lattice stresses are absorbed unequally by different regions of the nanowires. The center, he said, exhibits signs of high strain, while the outer layer is not strained as much. This behavior suggests each nanowire is actually composed of two distinct regions – something that is very important to determine the stability of the highly strained nanowires. The unusual structure of the silver nanowires also allows materials scientists to establish how strain distributes itself along one extended dimension. "This can answer a lot of questions that remain in materials science, particularly for this kind of common structure," Sun said. The paper was published online in the July 24 issue of Nature Communications. symmetry was indeed due to twinning.